X-Plane 11 is the world's most comprehensive and powerful flight simulator for PC offering the most realistic flight model available plus over 8000 airports and airfields around the world. This latest collection includes an additional six airports - Lugano, Toulouse, Weeze, Manchester, Maastricht-Aachen, Svolvær and is fully compatible across Windows, Mac and Linux systems. It's open structure allows users of all ability levels to change each element and adapt it to their preferred flight dynamics and is respected by enthusiasts and professionals for its realism and excellent graphics. This new updated 11th Edition boasts a much more immersive experience owing to the new rendering engine "Physically Based Rendering" which literally makes the whole simulated world appear in a new light. Illuminations and reflections appear realistic and change depending upon the viewing angle and the object's surface, exactly as you would experience in the real cockpit. This new technique works dynamically with the result that the graphical effects must no longer be pre-rendered and just as importantly, this massive improvement has not affected the performance. The UI has been completely redesigned with the control set up, aircraft, airports and weather options presented with a visual preview to make editing them simple and straightforward. This well thought out menu means control of the simulator is much more intuitive. The brand-new sound engine delivers high quality 3D surround sound that works on a global scale that responds to the physics around you. This new engine is also fully usable and extendable with third party add-ons. All of the content of X-Plane 11 has been enhanced and expanded. There are new aircraft with faithfully recreated 3D cockpits and extensive documentation, from small private planes such as the Cessna 172SP to the beasts of the sky like the Boeing 737. There is something for every pilot in X-Plane 11. X-Plane 11 now boasts over 8000 3D modelled airports with hangars and jetways, static aircraft and vibrant environments breathing more life into the airports. New cities from Europe and North America have been added to the global scenery and the overall scenery has been upgraded based on new Open Street Map material. 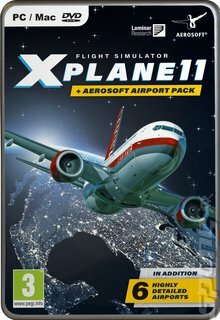 X-Plane 11 is the recognised as the most modern flight simulator available on the market today. Closer to reality than ever before.